Ann’s Place is pleased to announce that immediate past volunteer coordinator Jackie Morrison has been selected and will receive the “Hometown Hero” Award for Danbury at the 3rd Annual Hometown Heroes Benefit Dinner hosted by the United Way of Western CT. The event is planned for Saturday, February 27, 2016 at the Amber Room Colonnade. Marie Borner and Scott Cooney of Coldwell Banker presented Ann's Place with a check for $962 on January 13. Coldwell Banker Cares is a program in which local real estate agents donate a small portion of commission to go to a charity. This year they chose Ann's Place. Marie Borner is a dedicated Ann's Place volunteer and has worked on Festival of Trees since its debut 13 years ago. Parents and children had the unique opportunity to spend some quality time working on an art project over Christmas break. There were 14 parents and children who are impacted by cancer who came together on December 30 to create something special. The ages of children spanned from 7 to 16 years old and a great time was had by all. All participants felt it was a true gift to be able to spend time away from the stresses and challenges of daily life doing something fun and meaningful. The class was lead by our talented art teacher, Nancy Chapman. Supporting our existing and expanding community is of the upmost importance to us here at Ann’s Place. We’ve been working hard for the past several months thinking of ways to use technology to give our clients the best experience possible at Ann’s Place. And now, we are excited to introduce our new client support software - ClientTrack! The clients of Ann’s Place can look forward to online registration for clinical programs and activities. This new system, which is quickly wrapping up development, will lead to a better and faster activity sign up experience at home and in the building - as well as improved insight about how we can better serve our clients. It will put the ownership of our clients’ wellness plans directly in to their hands; by giving them access to the portal anywhere and on any device that has access to the internet. ClientTrack will serve to provide an opportunity to strengthen client-clinician relationships, a better way to explore all the services that Ann’s Place offers, and a chance to create even more personalized service. In December 2015, 64 volunteers from Ann’s Place wrapped books and gifts at Barnes and Noble in Danbury at the annual Gift Wrapping Fundraiser. Thank you to all the volunteers who gave up their time during the busy holidays to wrap gifts, and to represent Ann’s Place with such dedication, fun and enthusiasm. Thank you to Barnes and Noble for allowing Ann’s Place volunteers to be there once again this year. And thank you to all the customers for all of your donations and generosity. All of this in the spirit of giving, and giving back. The Board of Directors of Ann’s Place is pleased to announce that Ann’s Place will launch its new Health Equity Initiative, funded by the BI Cares Foundation, on July 22. A collaboration between Ann’s Place and The Hispanic Center of Greater Danbury (Centro Hispano), the Health Equity Initiative will enable Ann’s Place, a community-based cancer support center, to provide services at Centro Hispano, in downtown Danbury, as well as bilingual services onsite at 80 Saw Mill Road. There will be an Open House to celebrate this new initiative at Ann's Place, 80 Saw Mill Road, Danbury on Wednesday, July 22, 2015 at noon. Members of the public are invited. Light refreshments will be served. "Part of the Hispanic Center’s mission aims to improve the well-being of the diverse community in the Greater Danbury area by providing culturally competent preventive health education and promotion,” said Andrea Contreras, Interim Executive Director of the Hispanic Center. “We believe this new collaboration with Ann’s Place holds synergy with our current program and vision to make a difference in the community by expanding our services to be able to provide accessible cancer support services to clients and their families. We are thrilled to work with Ann’s Place and are looking forward to working with them and Candy in this new initiative." 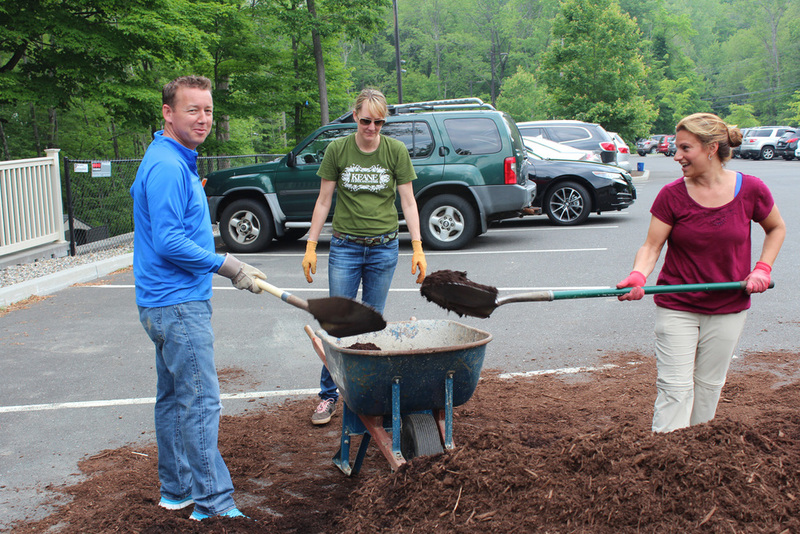 On June 11, 2015 Ann's Place was pleased to host the team from Boehringer Ingelheim Human Resources. 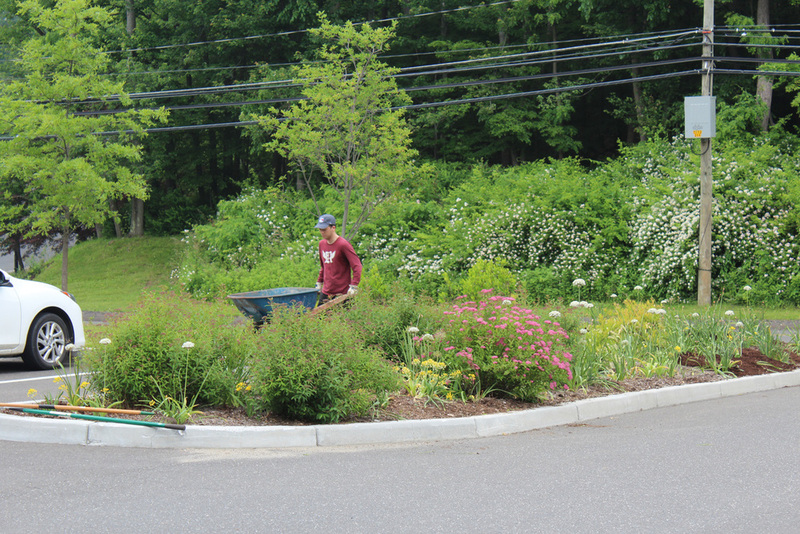 Under the direction of Ann's Place Horticultural Therapist Erik Keller more than a dozen hard working BI employees volunteered their time and energy to accomplish a variety of tasks around the grounds of Ann's Place. 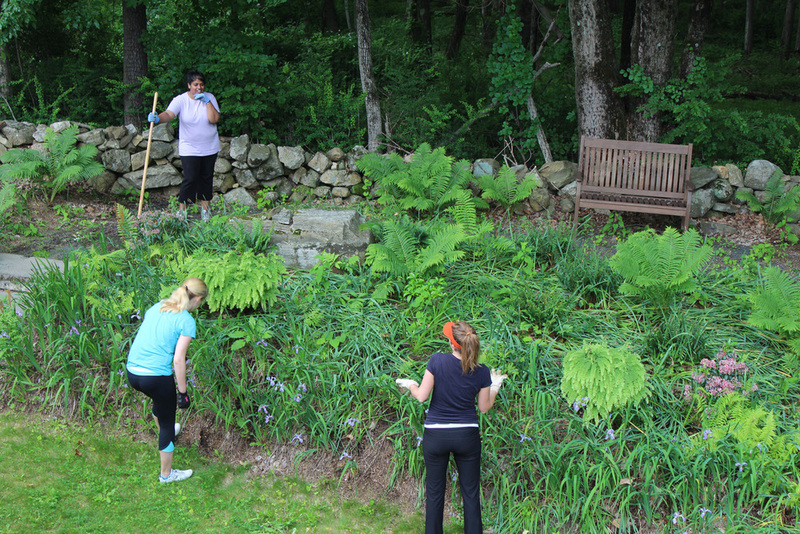 The team completed the installation of several new stone garden beds, spread mulch, completed much needed weeding, planted new shrubbery, and worked in the herb garden! 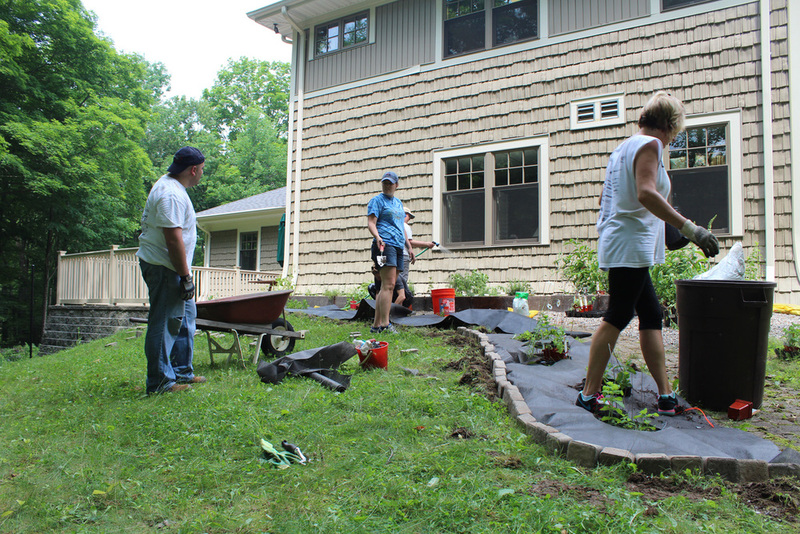 This is the seventh year BI HR has dedicated their time as part of a united way day of caring, this collaboration is one of many that has existed between Ann's Place and BI over the years. 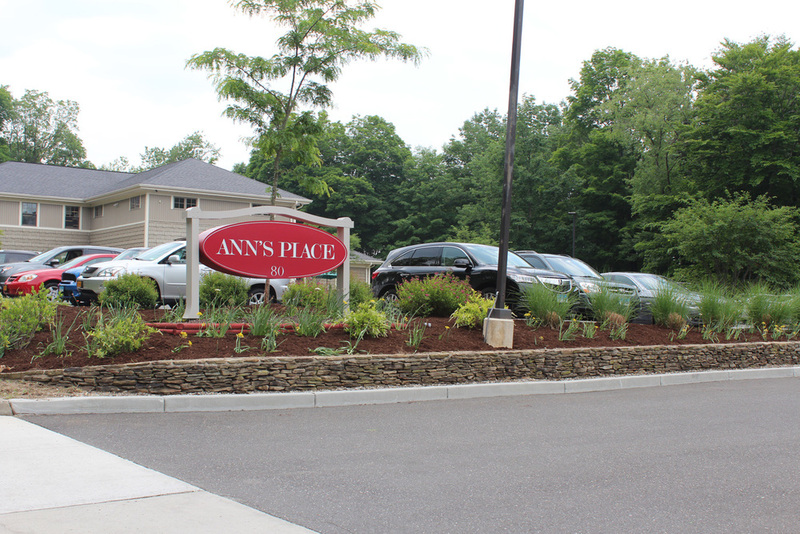 On May 1st, Ann's Place was pleased to host it's annual volunteer appreciation gathering! The event was a relaxed gathering attended by volunteers from across the agency. Attendees enjoyed refreshments, music, and good company. Last year over 1,000 volunteers helped us to continue our mission in some way. 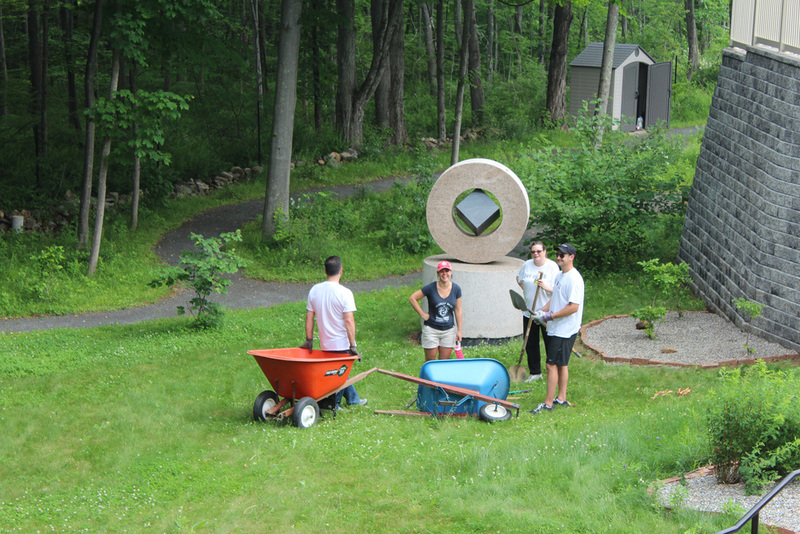 Above: Anthony, Lynn, and Su thank our volunteers. Watch Anthony Zeolla, President of Ann's Place, deliver a speech honoring Su Murdock's fifteen years of service to Ann's Place as Clinical Director! Thanks Su for all you do! There's a new bike rack at Ann's Place! A huge thank you to Mitchell & Karen Fink of Ridgefield, CT for donating & setting up the newest addition to our facility- Thanks also to the Ridgefield Bike Company for deeply discounting the price of this Bike Rack - Just in time for the sunny weather, bike over for a visit soon! Ann's Place wishes to recognize the small army of volunteers whose time, dedication, and willingness to volunteer at Ann's Place continues to astound us year after year! "I would also like to thank you for making my first year at Ann’s Place such a special one. Your kindness, support, and guidance are greatly appreciated and truly makes me smile."